Ahh, the Dew Tour is finally here, and this year its bigger and better than ever! With the Skate and BMX Vert, Skate Bowl, BMX Park, Surf and the new Mega 2.0 competition there is going to be so much to do over the next 4 days. Day 1 was all about soaking in the free dew tour experience with an endless array of booths, demos, prizes, autographs etc. etc. Inside the stride gum booth you can try out slacklining which is a flexible nylon rope highly tensioned between 2 points, basically a long narrow trampoline. The pros made it look easy doing 360’s and flips. 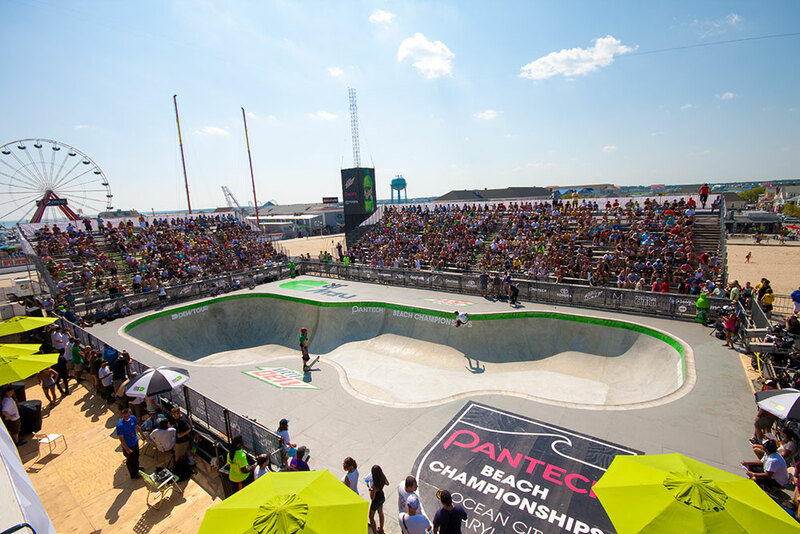 The highlights of the opening competitions were seen at the skate bowl led by skaters Bucky Lasek, Andy Macdonald, and many others. As the sun began to set the legends of the skate bowl came out to showcase their skills. With no one under the age of 45, skaters Steve Alba, Duane Peters and other proved why they are pioneers in skateboarding. Here are the official results: 1. Chris Miller, Calif., 88.50. 2.Christian Hosoi, Calif., 83.50. 3. Steve Caballero, Calif., 81.75. 4. Lance Mountain, Calif., 81.50. 5. Tony Magnusson, Calif., 80.75. 6. Pat Ngoho, Calif., 75.25. 7. Jeff Grosso, Calif., 75.25. 8. Eddie Elguerra, Calif., 69.00. 9. Steve Alba, Calif., 63.00. The first days excitement ended on the beach as pro surfers hit the water for the surf expression session. Towed by jet skis, surfers were launched into the air off waves only inches from the sand. The action continues today with BMX Park Prelims, BMX Vert Finals and Skate Vert Semi-Finals, as well as concerts from Theophilus London and Lupe Fiasco.